Back in February, I did a post about the Goody So Smooth 2-in-1 Brush, which I’d purchased many years ago. I really liked it, but it had been discontinued. So, I “dug around” and tracked down a seller on eBay who had a few. After purchasing a back-up for myself 😉 and receiving a confirmation e-mail that it was shipping the next day, I told the seller (David) about Hairscapades and the post. He advised me that several of the brushes sold within minutes of the post publishing and all but one sold by the end of the week!! 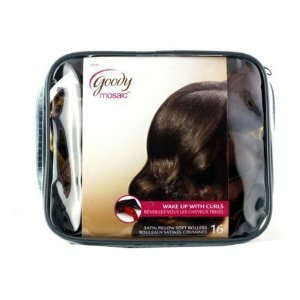 So, if you’ve been looking for hair tools and accessories, like the satin pillow soft rollers pictured above, Comfort Flex barrettes, Ouchless ponytail holders or any other other Goody item, check out David’s Ebay shop: num25bers. If you see something you want, e-mail David at dstein3078@aol.com with the item(s) and let him know that you learned about his store on Hairscapades and he’ll take it from there! Here are a few items that David currently has available. I was one of those buyers! I smooth down chloe’s edges with the 2 in 1 brush every morning..David was responsive and I recieved my brush within a few days and the shipping was FREE!!!! I gotta look at what else I ‘need’ on his site…PJism in EFFECT!